For those of who do not have the luxury of a walk in closet for our fashion ensembles turning a small room into one might be a great option. Small rooms can be easily equipped with all the necessary storage items that it would take to create a fabulous looking walk in. You should consider your situation carefully. Rooms in rentals and homes that one might plan to sell or move from in the near future might be better suited for less permanent shelving and racks. In a home that you own and plan on living in for some time you may opt for a more permanent reuse of space. Either way some elegant light blocking window treatments are in order. Carefully chosen window treatments can help create the look of a walk-in closet or just add an elegant touch to the room. Either way they will protect your privacy and preserve your clothing from the damaging rays of the sun. For people who prefer a more permanent solution to the situation, wire shelving can be an inexpensive and easy way to create hanger space. For matters of space efficiency you may even want to place a small bureau under one side of the rack that you can hang shirts above. Dresses and long coats can be hung on the other side. You can also build or hire a trusted carpenter to install some fantastic custom made modular shelving or regular wall mounted shelving that will look great with a little planning. 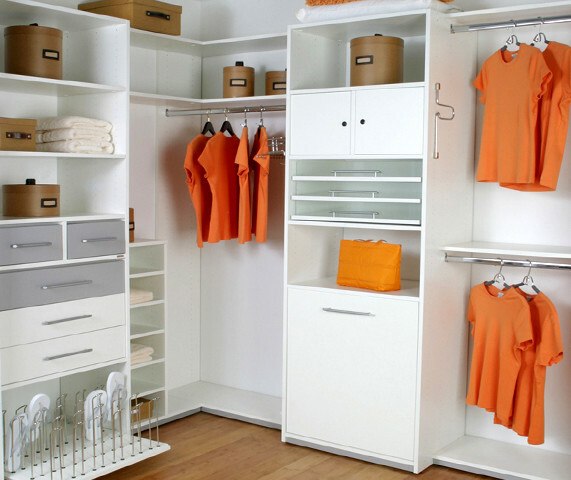 If your room already has a standard closet you could use it for shoes and accessories. Having a walk-in closet for you fashions doesn't mean having to spend a lot of money, though you could. There are many stores now that carry amazing and inexpensive storage containers and have solutions to many storage problems. Making your own walk-in out of your spare room can be a very gratifying project. It' merely a matter of a little imagination and creativity.